Fifth Wheel Hitch Or Gooseneck: Which Is Right For Towing Fifth-Wheel Trailer? Fifth wheel trailers are a type of travel trailer that is popular in North America due to greater road space. They become connected by hitching to the center of a pickup truck bed instead of at the back of a vehicle, as other types of trailers tend to do. 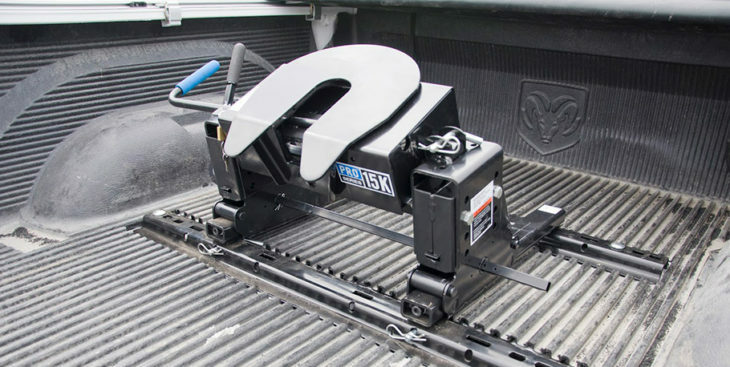 There are two types of mechanisms that allow a fifth wheel trailer to connect to a pickup truck – a fifth wheel hitch and a gooseneck hitch. Both types of hitches have their advantages and disadvantages when it comes to towing fifth wheel trailers. Which is the best one to use? Take a look at some of their upsides and you be the judge! The mechanism that a gooseneck hitch uses takes up less space in the pickup bed than a fifth wheel hitch does. This is especially useful if you plan to carry goods. The hitch is also easily dismountable when it’s not needed but the same can’t be said for the fifth wheel hitch. It comes in three different variants – under bed, above bed, and fold down. The fifth wheel hitch, on the other hand, has no variation at all and simply needs to stay stuck on the pickup bed for as long as you need to use it. This makes gooseneck hitches more flexible in terms of usage for different situations. Another great advantage that a gooseneck hitch has is in its towing ability. The mechanism is stronger than a fifth wheel hitch and can pull much more weight – which means that it would absolutely have no problem with handling a 25,000 to 30,000-lb trailer. What’s more, gooseneck hitches are also more affordable. In most situations, the budget is usually a factor for people and therefore this makes the gooseneck hitch a better option over the fifth wheel hitch, which can cost up to as much as $1,000 in some locations. However, the fifth wheel hitch has an ace up its sleeve. It is the only hitch out of the two that is allowed for use on recreational vehicles (RVs) and camping trailers that have a person inside. In fact, in most states, gooseneck hitches are not allowed to be used for trailers that carry passengers and can only be used to carry goods and livestock. Therefore, for camping enthusiasts and anyone planning to use a trailer or RV as living space or for travel, a fifth wheel hitch almost becomes an automatic mandatory pick. Fifth wheel hitches, while not able to handle as much weight as gooseneck hitches, fortunately still have the capacity to tow large trailers. Even though the prices at some retailers may shock you, searching for a bargain is still a possibility as it is when purchasing any automotive part. In the end, it all boils down to your particular circumstances and what you need to make things work. If you’re using a fifth wheel trailer for cargo or livestock transportation, then a gooseneck hitch is definitely a better option as it can handle a heavier load, is cheaper, and more flexible. On the flip side of the coin, if your trailer sees regular heavy foot traffic and is primarily only used for recreation, you’re going to need to invest in a fifth wheel hitch. Check your local state regulations to determine what is or what isn’t legal in your area. Although you’ll end up shelling out more dough in the short term, you can have peace of mind that you’re conforming to the law. Alternately, there’s a way that you can get the best of both worlds when you need to. Let’s say you have a gooseneck hitch on your pickup and you’d like to connect it with your fifth wheel trailer. Instead of having to purchase a new fifth wheel hitch which will undoubtedly set you back quite a bit financially, you can install a 5th wheel to gooseneck adapter that will allow you hook the two vehicles together. This neat little device cuts your spending in half and gives you the freedom to use what you need when you need it. The post Fifth Wheel Hitch Or Gooseneck: Which Is Right For Towing Fifth-Wheel Trailer? appeared first on Motorward.